Let’s be honest, despite all the Seattle problems on offense, the Hawks have a quarterback who can overcome them. It happened Sunday against the lowly (and that’s not an over-reaction) 49ers. And Wilson was a big part of that until his knee was bent at an odd angle by Eli Harold’s horse-collar tackle. After that, the rest of the game was more about getting to the end, seeing what the MRI showed and breathing, if that was possible. It was. Mainly because Wilson tweeted out something about God being good and most of the Pacific Northwest interpreted that as meaning his right knee was still sound. But this is the worst-case scenario many of the same people envisioned when the Hawks decided to save money and use undrafted rookie Trevone Boykin as their backup quarterback. Now there is nothing that says a rookie can’t be really good. Heck, Wilson was. And there is nothing that says the Hawks will fall apart with Boykin at quarterback. But there are two areas in which the Hawks decided to scrimp and save this season: the offensive line and backup quarterback. The offensive line had been poor until yesterday, though much of Sunday’s success can be attributed to the dearth of opposition as it can be credited to the play of the O-line. And Boykin was OK as well. He’s just not Russell Wilson. No one is. So Hawk fans will worry every time Wilson goes down awkwardly. That’s the nature of over-reaction. • It’s hard to over-react to Arnold Palmer’s death. He was that important. Honestly, no one this side of Babe Ruth meant more to well-being of a single sport. Arnold Palmer wasn’t the greatest golfer who ever played. But he was crucial to the game’s success. He took a staid, country-club sport and made it accessible to the masses. And made every professional golfer who followed a Scrooge McDuck pile of money. Palmer was a blue-collar guy from Western Pennsylvania. He played that way. He won and he lost with flair. Television loved him. So did the masses of men returning from World War II and Korea. Golf became their game in the 1950s and 1960s because of Palmer. It was no longer the purveyor of the starched-collar crowd. Guys in dungarees, hula-skirt tattoos and cigarettes began playing. Of this I have personal knowledge, from my father and father-in-law. But they were those type of guys, sons of immigrants, blue-collar workers who never would have thought about playing, ahem, golf, if it weren’t for Palmer. He was them, come to the course. Neither of them had tattoos (I don’t think) but they played in their jeans and smoked their cigarettes. They whacked at the ball with a ferocity that imitated Palmer. Golf was cool in a way it never had been before. Palmer was my father-in-law’s true sports hero. They were the same age. They came from the same background. Fred imitated Arnold’s swing. He mirrored Palmer’s passion. And, like Palmer, he always had time to help others with their game. Palmer taught an entire generation of Americans to love golf. He re-invigorated the British Open. He paved the way – in dollar bills – for Jack Nicklaus, Tiger Woods and the like. He wasn’t as accomplished as they – though he did win seven majors in seven years – but he was more important. What golf is today, it is because of Arnold Palmer. And that’s no over-reaction. 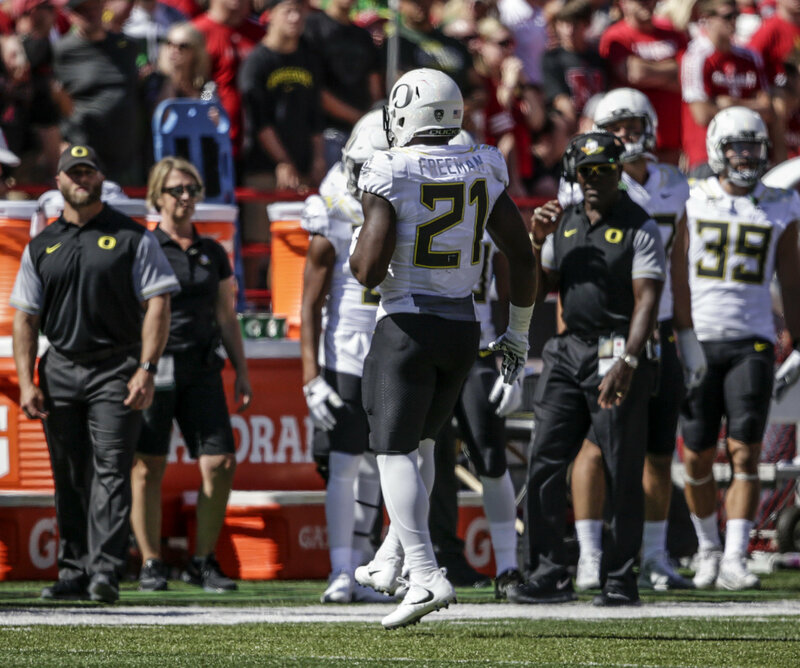 • WSU: Oregon is a one-point favorite this morning, though no one is sure the status of All-American running back Royce Freeman. But unless he can play safety as well, I’m not sure even Freeman’s return from injury would be enough for the Ducks. Saturday’s game will start at 6:30 on the Pac-12 Network. How do I know? Jacob Thorpe has a story about it. ... Elsewhere in the Pac-12, the Associated Press Top 25 is out and the conference has two teams in the top 10 but only three teams overall. Like this guy, I think UCLA should also be ranked. The Bruins only two losses are to Stanford and Texas A&M, both of whom are among the nation’s best. ... The Bruins will host Arizona this weekend. ... The conference’s two top 10 teams meet Friday night in Seattle, with Washington a three-point favorite over the Cardinal. ... Arizona State will take its unbeaten record to USC. ... Oregon State travels to Colorado, hoping to catch the Buffs still celebrating their win over Oregon. ... California has to bounce back from their loss to ASU before facing undefeated Utah. • EWU: The Eagle women got past Idaho 2-1 in a Big Sky Conference soccer match yesterday. • Chiefs: Spokane won’t be on the ice for a while but it made a couple roster moves yesterday. Meanwhile, the WHL schedule rolls on, with Portland scoring another seven goals in another win. • Mariners: There are seven games left in the regular season. Seattle needs to make up 2.5 games in the standings. A pretty daunting task. The M’s open a three-game series in Houston tonight. They are coming off a 4-3 win at Minnesota and took two of three from the Twins. ... By the way, the M’s have 82 wins. If you took an above .500 record back in one of our early season polls, you were right. ... Jose Fernandez’s death Sunday reverberated throughout baseball, including in the M’s clubhouse. • Seahawks: John Blanchette was in Seattle yesterday and he has the game story and a column from the 37-18 win over the 49ers. ... If it weren’t for Wilson’s leg injury, the big story coming out of Seattle yesterday may have been the re-emergence of Jimmy Graham. The big tight end had 100 yards receiving in the first half and was a force in the red zone. ... Or maybe the story would have been the offensive line. • Sounders: Don’t look now, but the Sounders have put themselves in a spot to make the playoffs. Not just yet, but they are three points out of the last spot having played two less matches than Portland, who is currently sixth. Seattle picked up three key points yesterday with a 4-2 road win at Los Angeles. Jordan Morris scored a pair of goals.